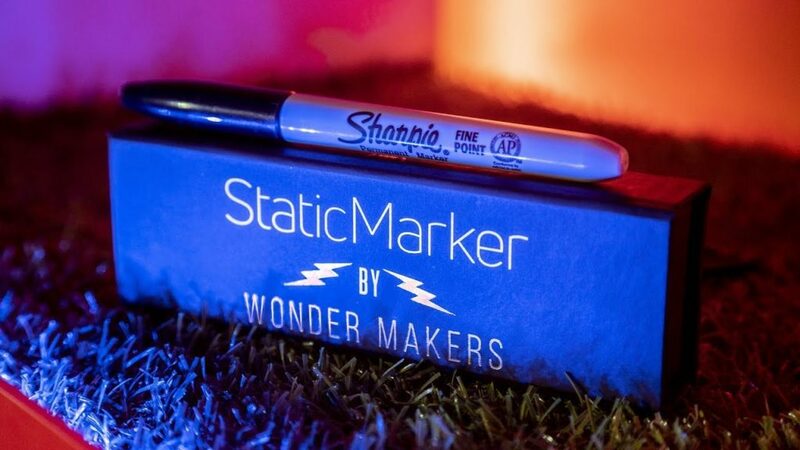 Static Marker is a very cool pre-made Sharpie gimmick that renders you with the power to make a Sharpie Marker into a magic wand. When you purchase this $29.95 utility device you are ready to go. You get a link to a streaming (not downloadable) 51 minute instructional video in either Russian or English. The gimmicked marker comes in a very nice box with a magnetic close. Extra materials are provided in case your marker breaks (as mine did). The first thing you need to know is that you are provided with a gimmicked Sharpie that can write. You must use the Sharpie provided; there is no gimmick that is transferable from Sharpie to Sharpie. You will be able to perform many of the tricks listed above immediately and without any practice because no skill is required. It is easy to learn and easy to do. The reset is immediate and there are no angles. You probably can hand out the marker and have a spectator use the marker, but if they are looking for something they will probably see the gimmick, which otherwise is invisible to an audience member that is not paying close close attention. The ad copy says “Instant reload…they mean “reset”. The effect that drew me to this trick is the electric shock trick. There are no batteries or electronics, but the spectator feels like they are being shocked. I like it a lot! As described above, there are many tricks that are seemingly unrelated to the “shock” trick such as a rubberband jumping off the pen, a ring defying gravity and the pen balancing in an impossible way off the tip of your finger. The magnetic card effect will require a bit of practice before you start performing the trick in front of an audience. My biggest complaint is that my marker broke on the first day. I have not yet re-watched the 15 minute segment on how to fix the marker, but when I get a chance, I will. I estimate that it will take me 5-10 minutes to fix. The instructions are taught by a Russian magician who speaks English with a slight accent. It is very easy to understand and to follow. I can recommend this trick for the many different effects, but be prepared to fix if and when it needs some minor repair. Very cool, very fun, kinds shocking. Thanks to Murphy’s Magic for allowing me to give this a test drive.